Corrosive buildup, dirt and dust can prevent the smooth action of a rim brake, which can result in a cyclist's worst nightmare: brakes that won't respond when you need them. This can manifest as a brake that won't disengage after you release the lever, or brakes that won't engage at all when compressed. The most common rim brake types are the cantilever brake and the V-brake, and the method of stuck brake repair is similar for each. Knowing how to correctly clean and remove brakes will allow you to repair them on your own, without an expensive trip to a bike shop. If the brake remains stuck after cleaning, use the 5 mm allen wrench to remove all four of the hex screws that attach the brake to the bike. For cantilever brakes, there will be one central screw rather than two separate screws. Use the 5 mm allen wrench to loosen the screw that pins the brake cable. Use the pliers to pull the brake cable through the opening after the screw has been loosened and completely disengage the braking mechanism. Carefully clean and lubricate the cylinder that attaches the braking mechanism, known as the pivot. Loosening the screw that mounts the brake shoe to the brake arm can make realignment difficult, so avoid adjusting the brakes for now. Use a sink and the toothbrush to remove dirt, rubber and grime from around the pivot. Take care not to get any lubricant on the brake shoe or rim. Clean the rest of the braking mechanism. Keeping the brake free of buildup can improve the performance of your brakes and discourage additional buildup from returning to the pivot. Remount the brake. Pull the cable back through the the housing until the brake is a millimeter above the rim. Once the cable is properly adjusted, cut off excess cable about 1 inch from the housing. If the brake is off center the cylinders will apply varying levels of friction. Use a 5 mm hex wrench to adjust the yaw, pitch, height and roll of the brake. The shoe should contact the rim fully and remain parallel to it when engaged and disengaged. It will have a slight "toe-in" on the leading edge so the contact is smooth along the braking action. Normal wear will eventually even out incorrectly mounted brakes, but getting it right initially will save you the squealing and poor braking performance associated with a misaligned shoe. Disc brakes are more complex, but will keep alignment much better than V-brakes and aren't as likely to become stuck. Visit your local bike shop to diagnose problems with disc brakes. Take care not to lubricate the shoe or the rim. 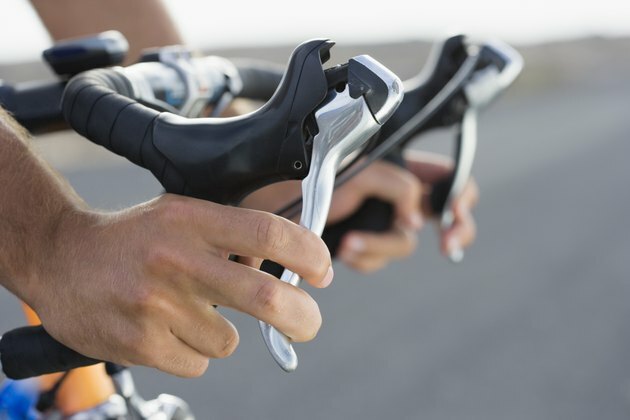 If you have trouble braking after cleaning and realigning the brakes, take your bike to an expert at your local bike shop before attempting to ride at all. Riding a bicycle with ineffective brakes is extremely dangerous.